Origin and Habitat: Sucre, Chuquisaca, Bolivia. 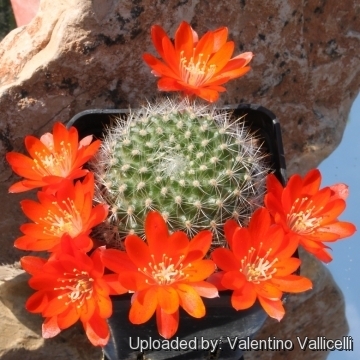 Description: Rebutia pulchella var. 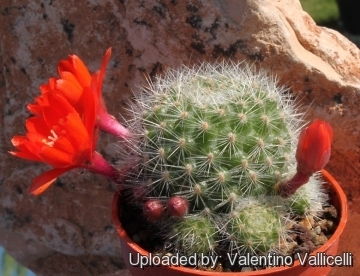 prolifera is probably one of the many geographical forms of the extremely variable Rebutia fiebrigii. 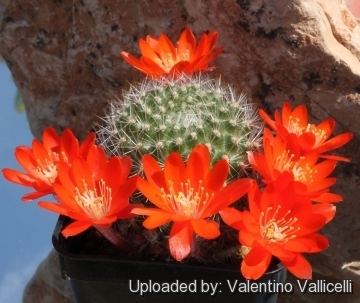 It is a small mound-forming cactus spreading out to 15 cm, with glassy-white, silky, short spines and light green tubercles thickly covering the body. 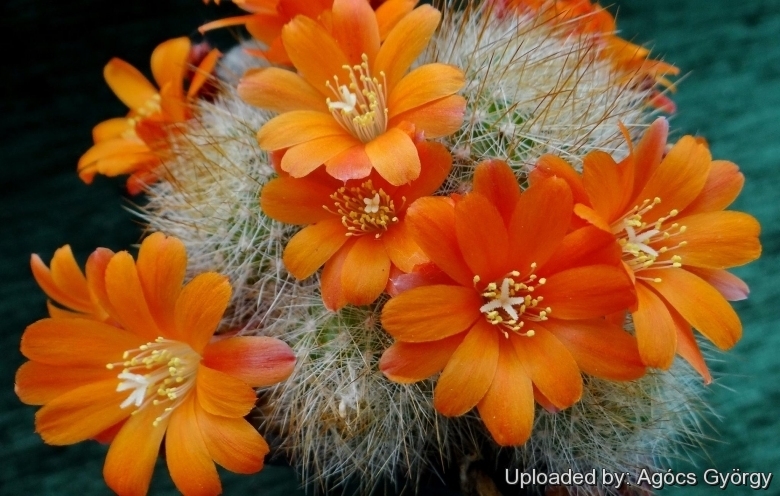 It produces vibrant orange-red flower. Habit: Mound-forming plant with bristly white spines. It grows quite close to the ground and offsets only with age. It would appear that in cultivation they grow larger and cluster more vigorously than in habitat. Stem: 3 cm wide, 4 cm tall, dark, flat, covered by distinctive tubercles similar to a Mammillaria, that are easy to see through the small spines. Spines: White, fine and soft. Flowers: Startling bright orange, funnel-shaped, 4,5 cm. long, 4 cm diameter from the base of the stems. Stigma lobes white. Blooming season: Flowers are produced profusely in spring, and remain open for up to six days. 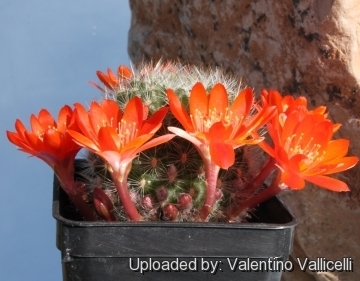 Remarks: Nowadays, under the name of Rebutia fiebrigii, botanists include several different forms, that were previously regarded as independent species. 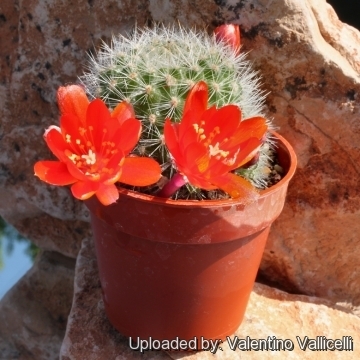 Cultivation and Propagation: Rebutia pulchella var. prolifera is a summer grower species that is easy to cultivate and recommended for beginners. The whole Rebutia fiebrigii complex has delightful flowers and the plants remain compact, and clumps can easily be managed by division. Another advantage is that the plants are cold hardy in winter if kept dry.